Whether you’re a passionate cook or a master microwaver, a beautiful kitchen will undoubtedly feature prominently in the home of your dreams. There’s no shortage of ideas to inspire today’s luxury interior designs, and while we may pour over magazine pages, wide-eyed at the high ceilings, top-of-the-line appliances and striking colours in our interior fantasies, it’s important to remember a show-stopping kitchen should be both good-looking and hard-working. Who wants to settle for a cookie-cutter kitchen? To swerve convention many homeowners are looking for new elements to customise and add that one of a kind wow-factor. Express your creativity with a statement chalk wall dedicated to fun drawings, inspirational quotes and little mementos from all of your visitors. Or you could use one of the many websites now available online to turn a favourite photograph into a durable, hip kitchen backsplash. A walk-in pantry must be a stand-out feature in any home cook’s dream house. Make the most of your scullery by incorporating floor-to-ceiling organisers for storing groceries, then dedicate the back wall to your most prized possessions, like heavy-duty appliances and breakable china. L-shaped corner shelving, bottle racks, vegetable baskets and pull-out pull out shelves will also help you make the most of this space. No longer do you need to take off your slippers in search of that morning caffeine kick, instead brew up like a barista with an in-wall coffeemaker. For the true connoisseur, built-in coffee stations are fast becoming the ultimate extra to include in kitchen remodels. Some add a separate countertop for storing a bean grinder and use the cupboard beneath for mugs and special coffeeware, or even a second fridge to keep condiments. Fresh latte, anyone? From teaming your standard fridge with a wine cooler to including a steam oven in addition to your conventional one, two is certainly better than one. 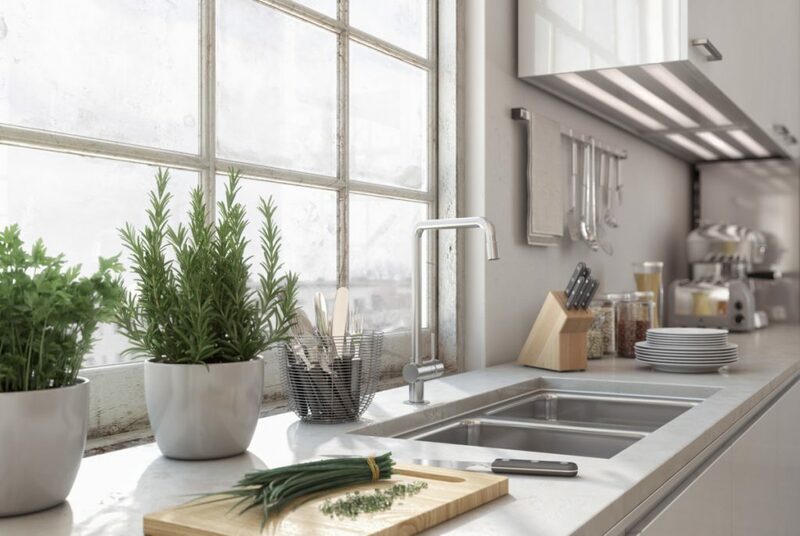 As an example a double-bowl sink is ideal for washing and then rinsing your dishes, but smaller prep sinks are also a hot feature as they help avoid cross-contamination during meal preparation. A huge helper for bigger households, or those who just love hosting at Christmas, installing multiples of similar types of appliances is the answer to achieving the most multifunctional kitchen designs. Nothing beats a sun-flooded interior space, so having floor-to-ceiling windows is a dream for many homeowners, especially if they could open onto an al fresco dining area. Natural light visually opens up a kitchen and makes the space feel more expansive, but unfortunately not all of us live in temperate climates. To welcome more sunlight into your kitchen, don’t obstruct good views with large appliances, instead fitting the sink and countertops towards your windows will help you enjoy the outlook whilst doing the dishes. Want to make your dream kitchen a reality? Then contact Black Rok Kitchen Design now and make an appointment to come and see us at one of our two showrooms in Uckfield or Heathfield.